Georgena departed this world in the early morning hours of November 15 while she was sleeping. She was 90 years old. Georgena was born in Humbolt, Nebraska, the fourth child of William R. and Irene Clement. Soon after graduation from high school and the end of WWII, she met the love of her life, Cairl Burdett Edgin, at the paint shop in the train station in North Platt. They were married in Kansas on December 13, 1945. The next day they left for Pacific Grove, California where many of Burdett's brothers and sisters had resettled from Arkansas during the depression. This would be the first of many moves back and forth from Pacific Grove to North Platte finally deciding to live, work and raise their family in Pacific Grove. Georgena was a homemaker until she was 40 years old when she went to work as the bookkeeper for Roto Rooter. She retired in 1989 and had 12 years to enjoy with Burdett until his passing in 2001. 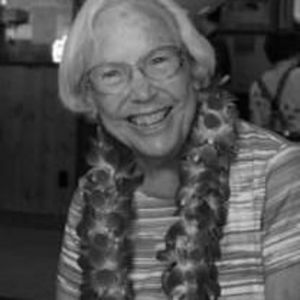 She was a devoted San Francisco Giants fan that could talk stats with the best of them. Her other great interest was reading. She enjoyed all genres from the classics to John Grisham and everything in between. But her greatest enjoyment in life was spending time with her great-grandchildren. She is survived by her daughter and son-in-law, Carleta and Dan Coelho of Monterey; grandchildren, Steven Gayman of Anderson, California, Kristy Smith (Tim) of Salinas, Shannon Norton (Alex) of Pacific Grove and Megan Vera (Rick) of Pacific Grove and her great-grandchildren, Nicky and Gabby Smith and Annabella Vera. She was preceded in death by her husband of 56 years, Burdett Edgin, daughter, Sharon Gayman, and granddaughter, Karen Gayman. Upon her request, there will be no services. She will be laid to rest with her dear husband at El Carmelo Cemetery in Pacific Grove.